Happy birthday, Robert A. Heinlein! Happy birthday to Robert A. Heinlein (7 July, 1907 – 8 May, 1988)! I am in desperate need of sci fi. (Especially after the Juno-Jupiter mission coverage!) 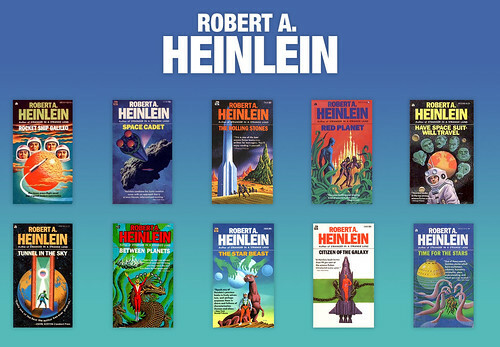 I haven't read any Heinlein. Any particular recommendation for a n00b? His short stories are a good place to start. I'm also fond of his juveniles. Scroll down to works--that should help! ETA: My fave juvenile is _Starman Jones_ and fave novel is _The Moon is a Harsh Mistress_. I wholeheartedly agree with the suggestion of his juvenile novels such as Have Space Suit, Will Travel (a terrific starting place), Citizen of the Galaxy, Space Cadet, etc. He didn't write down to his young readers, and therefore these novels still work very well for adult readers, too. Each of these stands on its own as an independent story, so there's no wrong place to start. It's all good! As for his stand-alone adult novels, I think Double Star is a very cleverly done character piece that still has a lot to say about politics (and is especially relevant during election season, whatever the reader's political leanings may be). My personal favorite of Heinlein's, which I definitely recommend, is The Moon Is A Harsh Mistress. It revisits the U.S. Revolutionary War, casting Earth as Britain and the moon as the colonies. Delicious stuff. I remember the day of his death rather well--we were all just stunned. Yes! I remember that, too. Very sad day. Some of his writing - especially, as you have said, his short stories and his juveniles - was very good indeed.